Yesterday at work I was speaking with a manager from our PR area, we were talking about social media, facebook, twitter, yammer, blogs. I told her that I wrote a blog and she was all interested, then I said it was about nail polish. She looked at me as though I had two heads and said "how on earth do you ever find enough to post about nail polish". I started my reply with "Oh you have no idea how..." then I stopped myself. Poor muggles, they just don't get it. It was so sweet when she said she had about six polishes, and thought she had too many. Oh dear! She just wouldn't understand how one person could end up with four polishes like those featured in this post. That is, four large particle scattered pink holographics. To my eye, they are all different, to a muggle they are all just pink and sparkly. The photos are labeled so you can see the differences yourself. 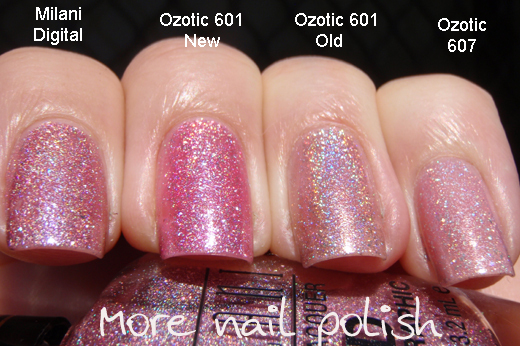 The old version of Ozotic 601 is the stand out here, but the other three all come a close second. 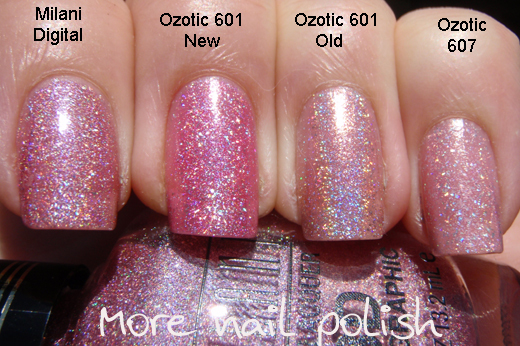 In the comments yesterday LeeAnn wondered what the Milani 3D holos would be like with Spectraflair added. Sunnydee said she had done it with the silver one and it was awesome, but the yellow one went too pale. I love the idea of a pale yellow/gold, so I think I might franken with one of these Milani 3D's and add some spectraflair to show you how it goes. BWAHAHAHA... 6 POLISHES ARE "TOO MANY"???? Thank you for the comparison! Do I see cotton fuzz? lol, This is a sweet comparison! Defiantly gotta pickup Milani 3D. 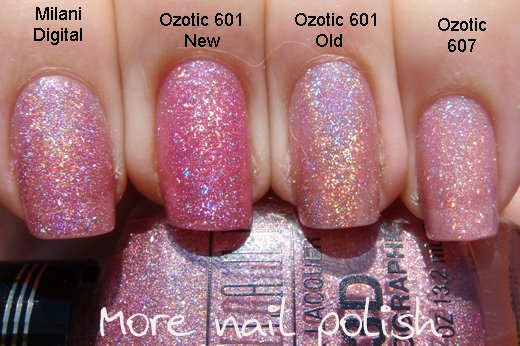 These Ozotic polishes are so beautiful! nicelyvarnished - I was going to tell people to ignore it, but thought that might draw more attention to it ;) Of course I didn't notice until I had taken the photos and had them downloaded. And I'm pretty sure it Lufee fur, she's cream and fuzzy, just like cotton fuz. Damn Fuzz! lol. Still choking from laughter here and wiping the tears away! And yea, that's pretty funny about her and the 6 polishes. My 20 year old niece came to visit recently and pulled her 3 polishes out of her purse. I brought out most of my stash and she freaked out. She spent a lot of her visit putting skittles on her nail because she wanted to try so many of the colors.